A lot of technology-related companies have diversified towards segments of the market that were not their original focus. Graphics card manufacturers began offering PSUs, PSU manufacturers started designing cases, case designers developed CPU coolers and so on. The most notable example of diversification is Corsair; the company could have written the book on it. What started off as company focused on memory-related solutions and entered the standard consumer segment by producing computer RAM modules, today has a vast selection of computer-related products that range from gaming peripherals and audio products to cases and PSUs. Their two most successful ranges of products, aside from RAM modules of course, probably are their cases and PSUs, with the company offering several series and tens of different products. 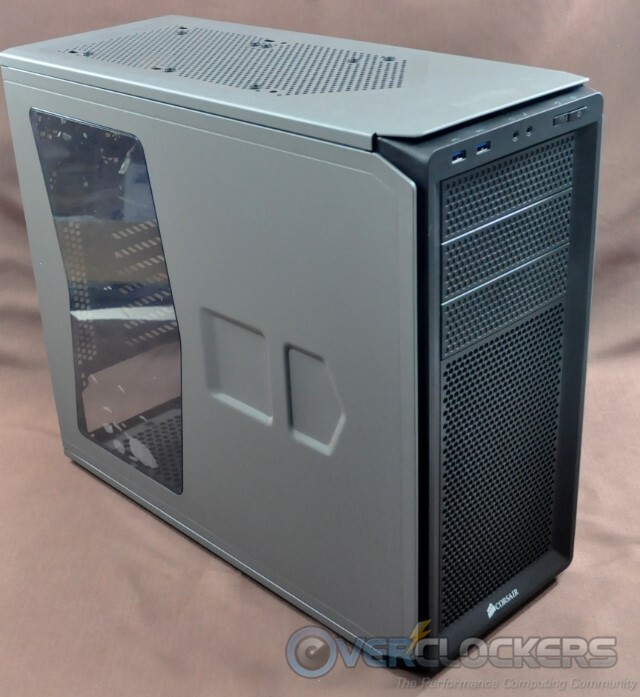 Today we will be having a look at the Graphite 230T, one of their latest cases. 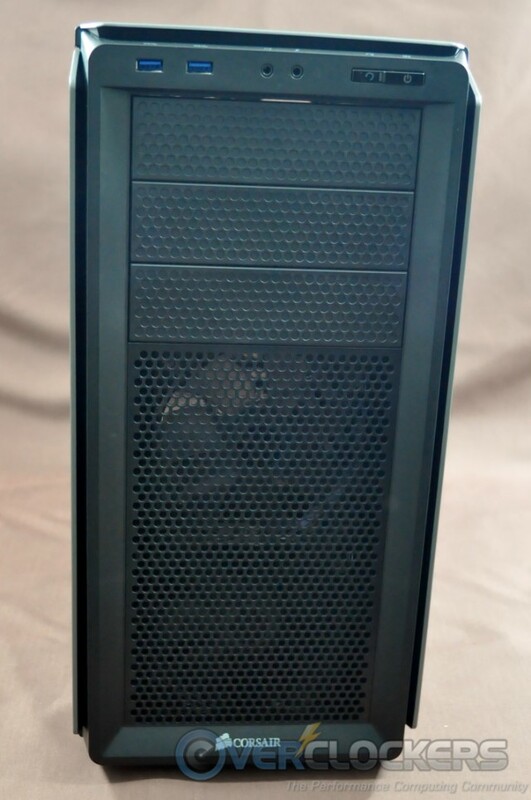 The Graphite 230T is being marketed as a simple, straightforward case for fast system building. 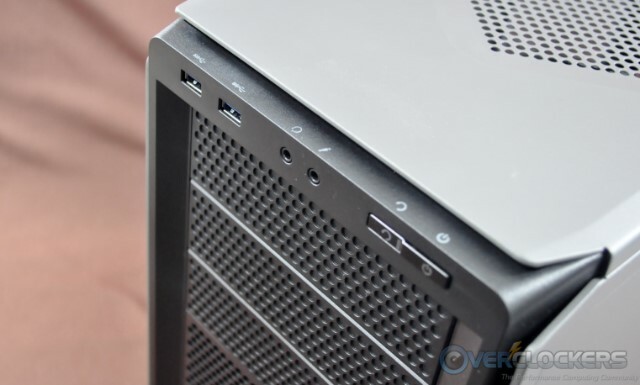 With a MSRP of just $69.99 ($79.99 for the windowed version), most readers would think that this is “just another low cost case.” However, there is more to the Graphite 230T than what first meets the eye. We will have a thorough look at the Battleship Grey Color version of the Graphite 230T in this review. 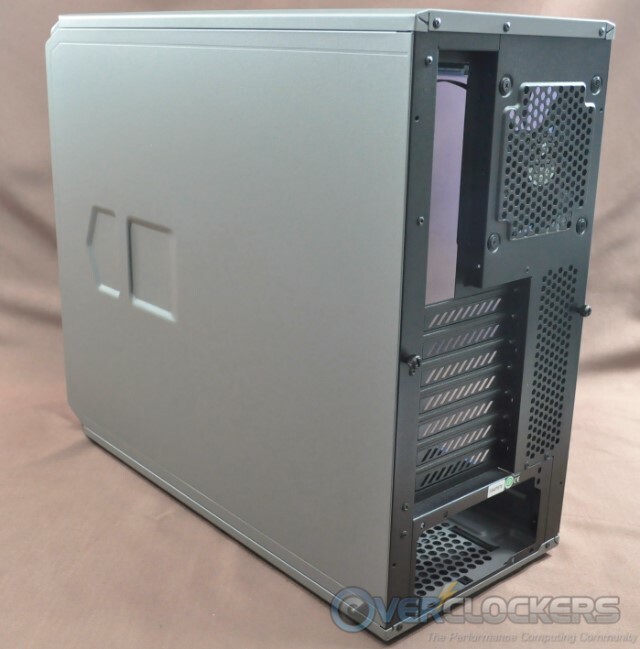 You will receive the Graphite 230T in an uninteresting, brown cardboard box, which is no better looking than the box of the cheapest case available. Inside it however, we found the case to be very well-protected. As you can see from the picture below, the case arrived to us safe even though the box received a beating during transport. 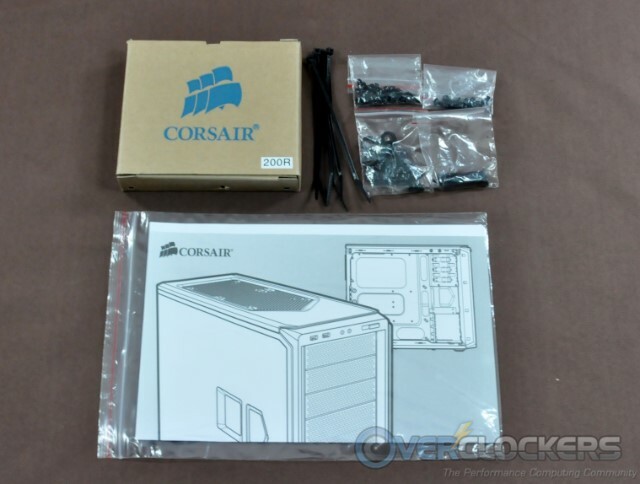 As far as the bundle goes, Corsair is supplying the absolute basics; just a manual, screws and a few cable ties. At least the screws are all black. The Graphite 230T, which we received in Battleship Grey, also sports an appearance that befits the name of its color. I should dare say that it is very well designed with a militaristic theme, based on simple geometric shapes and long straight lines. The plastic black faceplate stands out from the grey metallic panels which surround it. Although it looks like all of the faceplate is perforated, the three 5.25″ bays are actually not; they are solid plastic pieces. The rest of the faceplate is perforated and two 120 mm LED fans have been installed behind it. The Battleship Grey version has blue LED fans, the rest come with red LED fans instead. As with most cases nowadays, the buttons, headphone/mic jacks and USB ports are amassed near the top of the faceplate. We can see two USB 3.0 ports, headphone/mic jacks in the middle and the buttons to the right. The power button extrudes a little and is easy to press, but the reset button is somewhat immersed and you will probably have to use your fingertip/nail to press it. The rear of the case is also black, as only the side, top and bottom panels of the case are grey. Most of the rear is perforated, including the card slots. There also is a 120 mm exhaust fan installed. A large wedge-like geometric shape is embossed on the top panel, the inside of which is perforated and can accommodate two 120 mm or 140 mm fans. Watercooling radiators can be installed as well, but we would stick to the sub-30mm thick models as there is not much clearance between the top panel and the motherboard. 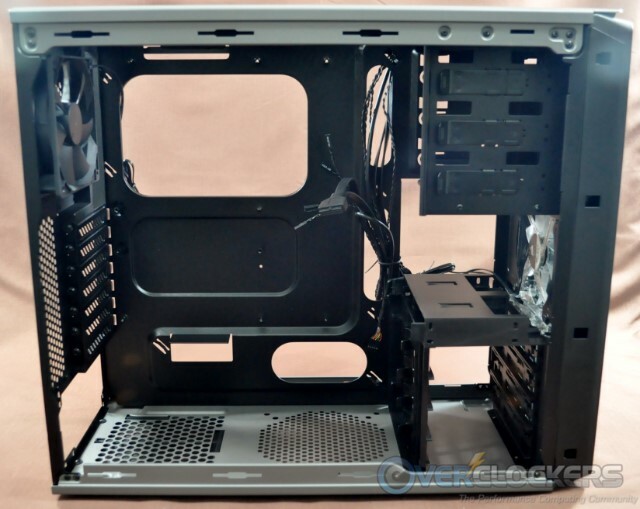 The interior of the Graphite 230T is all black, for any exterior color version. The exception to this is the bottom panel, which is dyed with the color of the version that you will buy. I have to admit that the grey bottom looks a little off and that I would prefer it in black, but it is not a major issue with the Battleship Grey version of the case. With the Rebel Orange version however, the color difference will be striking and that may be a good or bad thing, depending on your tastes/build. There is a slot on the bottom panel for a single 120 mm or 140 mm fan but none came installed by the factory. The drive’s cage is simple and interesting. It can hold up to four 3.5″ and another four 2.5″ devices, which can be simply inserted and locked into place without the use of any tools. There are, however, screw holes for added security if necessary. The design is clever, compact and functional. The only downside is that the 2.5″ devices are facing sidewards and you might need to remove a card or two in order to upgrade/install 2.5″ drives. 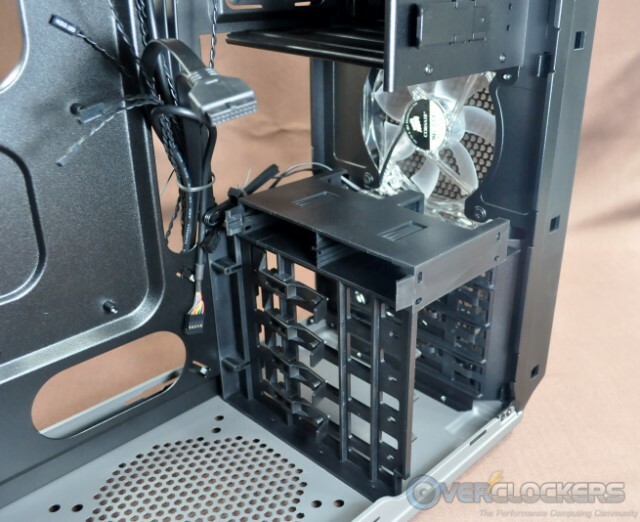 Although the cage is not removable, it starts below the first PCI Express slot, allowing the installation of any GFX card, regardless of length. This stands true only for the first slot however, therefore only one extra-long card may be installed. Still, most modern cards will easily fit in any slot, only special dual-core versions might become an issue. Standard ATX motherboards fit like a glove inside the Graphite 230T. The openings to the right of the motherboard’s tray will be right next to the edge of a full ATX motherboard. 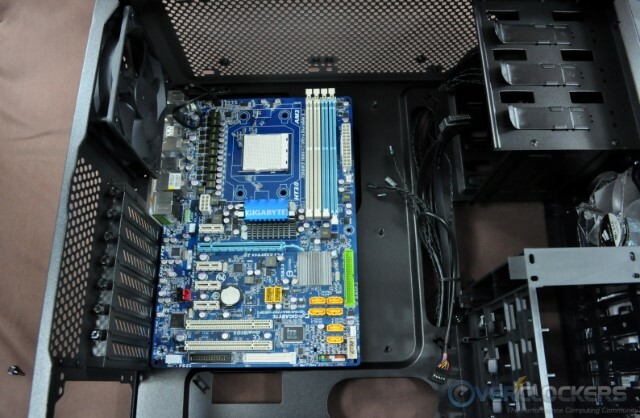 A narrow form ATX motherboard however (20 cm wide), as the one depicted below, will bring the edge 5 cm away from the openings and there are no secondary openings closer to the motherboard. You should not try to fit an extended ATX motherboard in the 230T, as it will simply not fit. 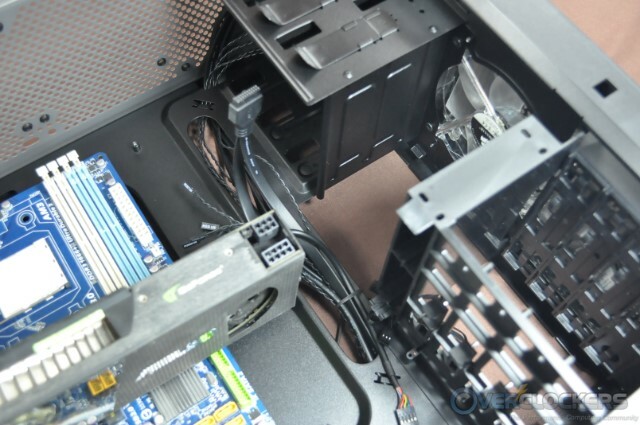 The PSU is nearly touching the motherboard once installed, therefore you cannot really route cables from the small square hole under the motherboard. You can route them from the oval opening at the bottom right side of the motherboard tray. Here is the breakdown on the system we’ll be using for our benchmark session. As the Graphite 230T is a case designed for maximum value, we will be comparing its performance against three other products; the similarly priced Corsair Carbide 200R, the premium Corsair Obsidian 650D and the very low-cost Asus TA-86. The graphs display the temperatures after the system has been under maximum stress for at least 30 minutes. The ambient room temperature at the time of the tests was 21 °C. 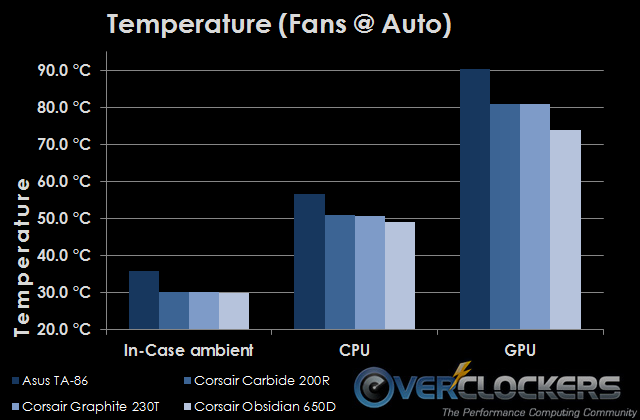 As it can be seen in the graphs below, the Graphite 230T offers similar performance with the Carbide 200R; a natural outcome, as these two cases share the same chassis and similar cooling options. The Graphite 230T seems to be maintaining slightly lower temperatures, although the difference is small and can be even considered a measurement error. The Obsidian 650D clearly performs better but not by a terribly large margin, especially considering that it also costs almost twice as much as the Graphite 230T. Of course, the Graphite 230T is in many ways inferior to the Obsidian 650D, but they are marketed to entirely different audiences as well. Finally, the great improvement over the basic Asus TA-86 displays the performance difference between a budget case (Graphite 230T) and a cheap case (Asus TA-86). We cannot really compare these two in terms of quality, as the very word quality and “Asus TA-86” cannot fit into the same sentence, it simply cannot get much worse than that. 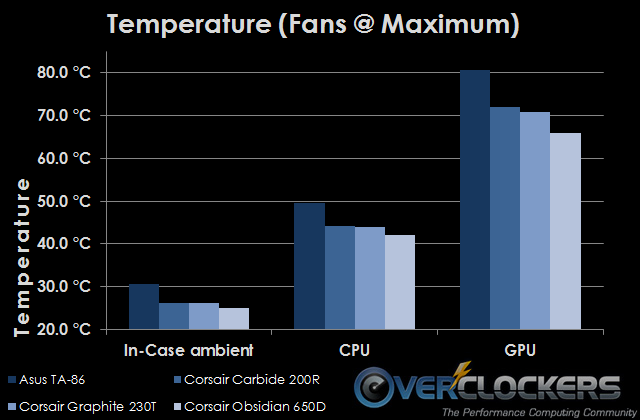 With a product such as the Graphite 230T, the budget is tight and Corsair obviously wanted to keep the retail price low. 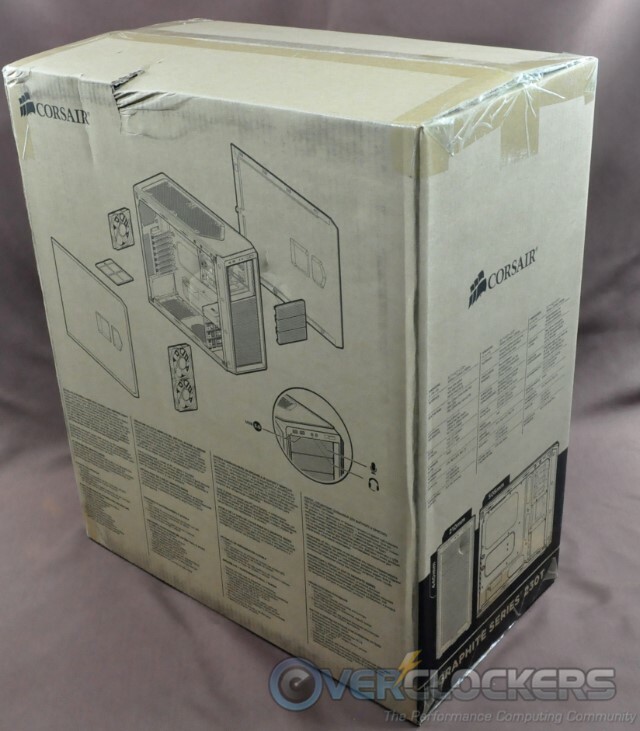 Instead of lowering the quality of the actual product however, Corsair disposed of everything without practical value to the end user – fancy looking boxes and bundled extras. 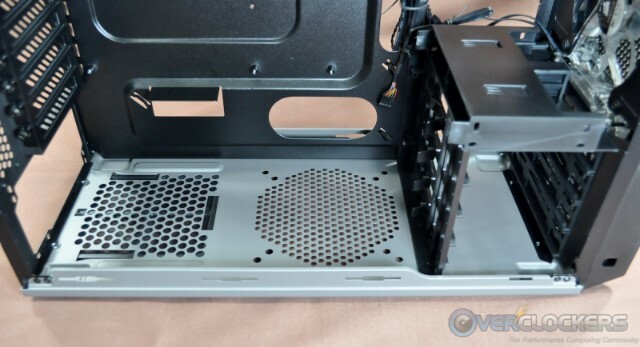 There are also no extra appearance-enhancing features, such as rubber grommets on the motherboard tray openings. However, what really counts to users seeking value for their money remains. These users do not really care about fancy looking boxes and bundles, but for a quality product that will perform well and last as long as possible. The Graphite 230T is a high quality, well-made product with a spacious interior, and excellent for quick installations and upgrades. 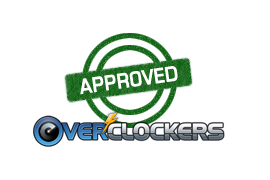 It also is very versatile, allowing the installation of high-end modern hardware and watercooling systems. Whether you like the way it looks or not surely is a subjective matter, but I dare say that it is significantly more beautiful than the extremely simple 200R for just a few bucks more. It does not really perform better than the 200R, neither is it more spacious. But that is expected with the two cases sharing essentially the same chassis, and their only major difference being the external appearance. If you want to buy a no nonsense case and are willing to pay $10 more for it, then the Graphite 230T comes highly recommended.